Yeah, but: Why was I surprised? The Long Version: The "President's Choice" brand is one of the major successes of marketing. Dave Nichol made himself a household name and completely changed the perception of store-brand food, something that many companies have tried since but without being able to match Loblaw's resounding success. "PC" products now dominate their shelves, giving them both a huge differentiator and a major advantage when it comes to selecting the competitor's brands that they allow on their shelves. PC products remain the only reason why I go out of my neighbourhood to reach a Loblaw supermarket. Their "Memories of" line has some excellent sauces and marinades, the the Memories of Montego Bay is my favourite Jerk sauce. (It's a pity that the mild version, "Vague Memories of Montego Bay", is no longer around.) And with the striking exception of the Chocolate Black Cherry Cola, I can't say that I've ever been disappointed by something that they put their name on. But the cookies – ah, those cookies. 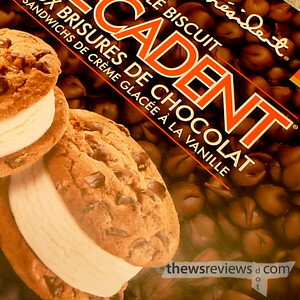 Calling a cookie "The Decadent Chocolate Chip" seems a little overblown, but they are good. One of the signature products of the President's Choice line, they've been around for a very long time. When Penny saw that there's a new ice cream sandwich version, they joined the list for our upcoming Canada Day party, where they'll socialize with dozens of PC hamburgers, chicken breasts, and a handful of tubs of President's Choice ice cream in interesting flavours. Good times. 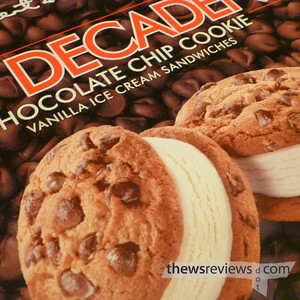 But not all of the Decadent Chocolate Chip Ice Cream Sandwiches are making it to the party. I don't know why I was expecting something else, but these little 100mL sandwiches are two of the actual chocolate chip cookies, each facing out, with a thick slab of vanilla ice cream between them. The ice cream is good, too: it's a hard combination to get wrong, and they didn't. There's a chocolate chunk cookie version with chocolate ice cream, as well – something else that may not make it to the party.